What is 5G, when is it in the UK, how fast is it and what 5G phones will launch in 2019? 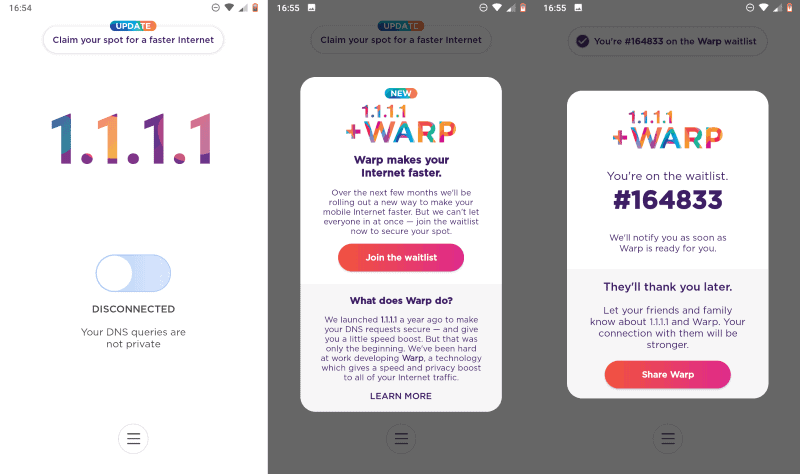 Cloudflare revealed the company's first VPN product today called Warp which it plans to launch as part of the company's 1.1.1.1 application soon. April 1st is probably the worst day to make announcements for products that do exist. Cloudflare apparently could not pass the opportunity to select April 1st, or 4/1, as the date to reveal Warp. The company launched a DNS service a year ago and with it the DNS applications 1.1.1.1 for Android and iOS. The service supported security features like DNS-over-TLS and DNS-over-HTTPS, a strict no IP address logging policy, the deletion of logs in a 24-hour period, and fast speeds especially compared to default DNS services operated by most ISPs. Cloudlfare calls Warp a "VPN for people who don't know what V.P.N. stands for". The explanation that Cloudflare gives is relatively weak: according to Cloudflare, it is the simplicity that makes it attractive to users who don't know about VPN services. The explanation is weak as Cloudflare's solution is not the first that offers a simple option to use a VPN. Warp encrypts all Internet traffic, respects end-to-end encryption, and does not require that users install a root certificate on their devices.Unencrypted Internet connections will be encrypted but only between the user's device and Cloudflare's server (similarly to how all VPNs handle this). The same is true for all respected VPN services. Cloudflare promises that Warp's performance, reliability, and focus on preserving power are what will set it apart from comparable services. We’ve built Warp around a UDP-based protocol that is optimized for the mobile Internet. We also leveraged Cloudflare’s massive global network, allowing Warp to connect with servers within milliseconds of most the world’s Internet users. With our network’s direct peering connections and uncongested paths we can deliver a great experience around the world. Our tests have shown that Warp will often significantly increase Internet performance. Warp will be offered as a free option that is included in the company's 1.1.1.1 application. Cloudflare is working on Warp+, a premium version of Warp that will be available for a "low monthly fee" for people who want more speed. It is not uncommon for companies to finance free versions of a product using premium offerings. Warp+ follows Cloudlfare's web-based servicing model. The company offers a base version of Cloudlfare for free and paid upgrades to unlock certain features. browsing data won't be sold or used for targeted advertising. user-identifiable log data is not written to disk. that users may use Warp without supplying their name, phone number or email address. that it will hire third-party auditors to make sure the service delivers what is promised. The service itself uses WireGuard combined with Cloudflare's Mobile SKD. Warp+, the premium version of Warp, will use Cloudflare's Argo next to that as well. Android or iOS users can join the waitlist in the 1.1.1.1 application. Some may not see the option to join the waitlist yet as update propagation takes some time usually.